Will Burlington Voters Approve a Last-Ditch Plan for the Moran Plant? You could argue it's a rite of passage for Burlington mayors to hatch a plan to convert the defunct Moran power plant from the waterfront's chief eyesore to its crown jewel — and then watch hopes collapse in the face of political challenges and financial realities. Miro Weinberger canned his predecessor's plan upon assuming office and now, nearly two years into his term, has thrown his weight behind what he says will be the final attempt before the city yields to what he calls "the wrecking ball of Damocles." 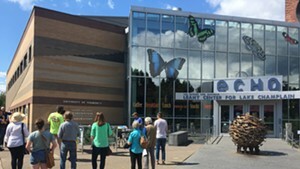 The mayor announced his plan, along with a slate of other waterfront projects that would draw on tax-funded financing, at the ECHO Lake Aquarium and Science Center on January 13. 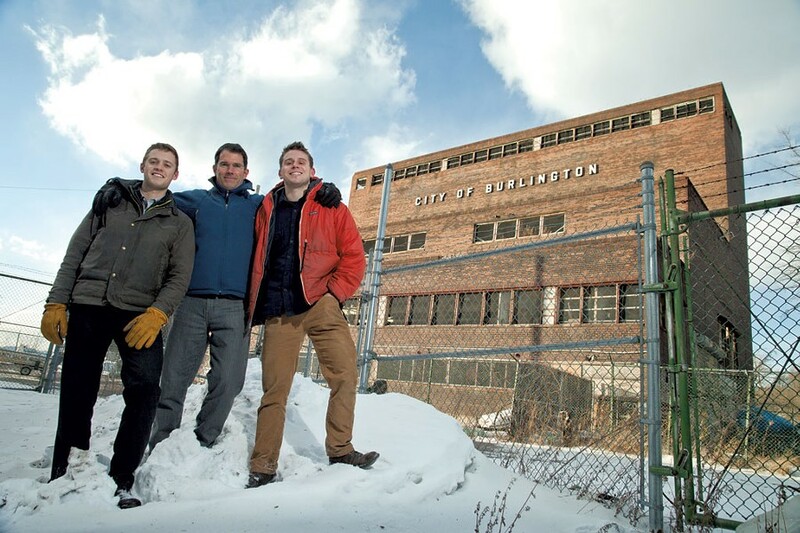 Joining him at the much-anticipated event were city officials, city councilors, experienced developers and two conspicuously young faces: University of Vermont seniors Tad Cooke and Erick Crockenberg. Think again. Cooke and Crockenberg, along with their more seasoned business partner, Charlie Tipper, conjured up the $26 million plan that won the endorsement of Weinberger and, later, the Burlington City Council. That means if voters approve the plan on Town Meeting Day, the project will benefit from $6.3 million in tax-increment financing, or TIF (see sidebar). If they don't, or if developers can't pull off the project, Weinberger plans to end the mayoral ritual and demolish the plant. "I think what Burlington voters want is resolution," he said. The "New Moran" plan is the latest proposal to turn the 61-year-old, seven-story coal plant — which has sat dormant for the last three decades — into a functional public space. This one may be less fanciful than some of the failed proposals that preceded it — there's no ice-climbing wall, for example. It features a Flynn-size performance space, along with restaurants, a brewery, a maker studio and a community garden center. The most pressing question, of course, is, can this team raise the money required? And if it does, will the venture be financially sustainable? There are, in Tipper's own assessment, "a million ways this thing can fail." Crockenberg and Cooke grew up together in Charlotte and trace their friendship back to a middle school art class. Fast forward approximately a decade to 2012, and both were college juniors studying renewable-energy systems at UVM and sharing an apartment in the Old North End. On July 4, they were strolling through Battery Park in the wake of a serious rainstorm, taking stock of the damage. Their attention turned to the hulking coal plant. Wondering why nothing had been done with it, Cooke remembered one of them saying, "I don't see why we can't make this happen." A week later, Crockenberg followed up on that casual query by sending an email, out of the blue, to the mayor. He wrote, "A couple UVM friends and I have been mulling over ideas, and are wondering if it would be possible to get some basic architectural/layout plans, as well as a brief overview of what is currently being done for refurbishment of the Moran plant. We would love to put some of our ideas onto paper, and potentially work them into a larger design project this coming semester." Crockenberg and Cooke knew next to nothing about the plant's history. But rather than dismissing their inquiry, a member of the mayor's staff responded, referring them to Burlington's Community and Economic Development Office. Emboldened, they spent much of that summer brainstorming in coffee shops, pestering city officials, picking the brains of family friends and researching the plant's backstory. By the time the city launched its Public Investment Action Plan (PIAP) in early 2013 to solicit waterfront-development proposals that would draw on TIF funds, the duo was ready with a proposal for Moran — one of about 50 submitted in the initial round. By fall the PIAP committee had narrowed the field to 29, and in early January Weinberger made his picks. Roughly one and a half years after that day in Battery Park, Cooke and Crockenberg stood alongside the mayor as he asked the city to send millions of dollars their way. Both have finished their college credits and say they are working full time on the project. Cooke also waits tables 30 hours a week at Winooski's Misery Loves Company; Crockenberg keeps busy with ballroom dancing, pottery and drawing classes. Both will graduate this spring. The mayor says that Cooke and Crockenberg's enthusiasm drew him in, but what sold him on the project was the cadre of experienced developers, fundraisers, engineers, architects and potential tenants they had enlisted by the time the proposal landed on his desk. "The partnerships, reflected in their proposal, with established local individuals and organizations that have been successful is very meaningful to me," said Weinberger. Tipper, a seasoned fundraiser, was a crucial recruit for the UVMers. Tipper had also submitted a plan for the Moran Plant, but the PIAP committee gave top ranking to the Cooke/Crockenberg approach, so the three decided to join forces. "Along come Tad and Erick with basically the perfect skill set to fill in all the blanks in my equation," Tipper said. "And if I may be so bold, I think they felt the same way. They needed someone with experience under their belts." What exactly is the skill set of two UVM undergraduates finishing up a self-designed major in "ecological food and energy systems?" They're the first to say they aren't qualified for the job. The biggest project they've overseen to date was a $58,000 grant to create a manure-powered greenhouse — an impressive feat for college students, no doubt, but with a budget dwarfed by Moran's. Their first crop of tomatoes withered on the vine. Along with energy, Cooke and Crockenberg bring networking skills to the project. They've rounded up many of the organizations — the Farmhouse Group, Zero Gravity Brewery, Local Motion and others — that won over Weinberger. Asked if people tried to dissuade the two of them along the way, their response was, "Not really." In fact, Cooke met with Erik Hoekstra, a real estate investor with Redstone Commercial Group, in July 2012. "Not crazy" was Hoekstra's reaction to their idea. Cooke wrote it down in a notebook he hasn't thrown away. Tipper, 54, describes himself as a "redeveloper," home designer and real estate investor. Over the years, he and his wife, Mima — both Middlebury College alums — have donated generously to their alma mater, the Flynn Center for the Performing Arts, ECHO and the Vermont Land Trust. They've invested in a number of local businesses, including Vermont Smoke and Cure, American Flatbread and Guild Tavern, as well as the Vermont Sustainable Jobs Fund's Flexible Capital Fund. Tipper has also led fundraising campaigns for the Vermont Nature Conservancy, the South Hero Land Trust and the Mad River Glen restoration campaign. He describes his original proposal for the Moran Plant as a "very low-budget, pared-down concept" that turned the building into a "functional ruin." Although this contrasted sharply with the pricier and more involved proposal Cooke and Crockenberg put forth, Tipper said they shared the same vision of creating an "energy-positive building" tailored to the needs of the community. Also on the financing side, the team reeled in Jeffry Glassberg, a 52-year-old Waltham-based developer with expertise in securing tax credits who is serving as project manager. "They provide tremendous horsepower," Glassberg said of Cooke and Crockenberg, who, like Tipper and him, are working without pay until the project proves viable. "Ultimately the various public funders, the lenders, the investors that we are going to need to provide the capital, are going to need comfort that we, in fact, are going to get this done," Glassberg said. "My role is to provide that comfort." Or, in less lofty terms, he added, "My role is to be the serious old guy." The City of Burlington would retain ownership of the Moran Plant, while the organization created by Tipper, Crockenberg, Cooke and Glassberg would oversee construction and manage the building through a long-term lease arrangement. an "educational nanobrewery" with classes and "competitive residencies for brewers from around the world"
Annual rent revenue for all of the above is expected to be $762,700 in the first year, comfortably higher than projected operating costs of $554,680, according to the financial analysis the group submitted with its proposal. Those numbers would fluctuate depending on loan repayments and tax-credit fees, and the team expects to dip into the red once, several years out, due to one especially large balloon payment. After that, their projections show revenue rising to roughly $1 million by 2029. The partners estimate $15 million of direct and indirect investment each year as a result of increased activity in and around the building. For the actual construction, they've placed the "economic multiplier" at $36.5 million. Now the foursome just needs $25,446,309 to make it happen. On January 21, back at their headquarters — a tiny, one-window room in a glassblowing studio on Pine Street — the four men met for the first time since the mayor's announcement. Crockenberg put out an array of teas that Cooke's mother had picked out — Stress Relief, Relaxed Mind, Calming, Detox and peppermint. Tipper and Glassberg both summarily dismissed the spread, opting for Earl Grey instead. "I'm not sure I want to relax," Glassberg explained. "We have some challenges in terms of numbers we need to discuss." Then there's about $2 million for design work, $2 million for marketing, permitting, legal and other "soft costs," and another $2 million for financing — the costs associated with taking out loans and holding funds in reserve. While the group can't guarantee that the project will succeed, by taking on the financing duties, it offers the city and taxpayers more protection than previous proposals. With the ice-climbing proposal, for example, it was up to the city's community and economic development office to cobble together millions in tax credits and other public-funding sources. On top of the TIF money, the team hopes to draw down federal and state tax credits to the tune of roughly $11 million. That includes more than $7 million in "new market" tax credits (NMTC) and more than $3 million in historic tax credits. Securing the historic credit is straightforward enough, Glassberg said. "If the building is listed on the National Register of Historic Places, then as long as the plans comport with the secretary of the interior's standards for rehabilitation, there is no competitive process for it. You can just claim it." Moran has been on the register since 2010. New market tax credits are less of a sure thing, according to Glassberg. The federal government makes a fixed number of credits available each year to spur investments in low-income communities, and developers compete for them. The Moran site has been deemed eligible, based on Burlington census numbers, Glassberg said. Private investors receive a tax credit against their federal income tax liability in exchange for funneling investments into projects that have received an NMTC allocation. The federal government awards the tax credits to designated community development entities, which in turn decide what projects will receive the credits, and thus the ability to raise private investment capital. Housing Vermont runs the only CDE in Vermont — Vermont Rural Ventures — but local developers can also seek arrangements with other CDEs around the country. Glassberg said the team has had conversations with several of these entities, as well as potential investors. "I can say without qualification that there was a great interest in the project," he said, adding, "There is no guarantee. We are going to have to go out and compete and work with several CDEs to secure the credits." The partners also need to raise roughly $4 million from philanthropic sources, which is by their own admission an ambitious goal. This falls within Tipper's purview. He says they'll be seeking foundations and individuals to make donations to or investments in the project. Loans, a federal grant secured by CEDO and contributions from the tenants for sprucing up the interior space would cover the remaining costs, the group expects. Just how realistic is the philanthropic portion of the fundraising goal? That will be clearer by the end of September, when the partners will have finished a study gauging interest levels among prospective donors and investors. Weinberger will consult that carefully before he decides whether the city should take on the TIF debt or pull the plug. Another major milestone will come in spring 2015, Weinberger said. "By that time they should have made considerable progress in terms of lining up finances and committed tenants. If they haven't made substantial progress by then, that would be troubling." The administration will need to make a final decision before the New Moran team closes on the project — though no firm date has been set. If all goes according to plan, construction would start a year from then, in spring 2016. Beyond the financial uncertainty of the proposal itself, Weinberger has ruffled some feathers by tethering it to a fallback option. The mayor's decision to make demolition the automatic Plan B ties the plant's fate to one particular proposal in a way that's never been done before. Weinberger points out that he's already had to request one extension from the legislature to prolong the city's borrowing authority for TIF revenue. By holding out hope that something will happen with Moran, he said, "We are putting other projects on hold to see if this will pan out, so there really is an opportunity cost." But the prospect of demolition isn't bringing every Burlington resident peace of mind. The only two city councilors to vote against the plan — Progressives Rachel Siegel and Vince Brennan — did so on the grounds that it presented voters with a false dichotomy. Louis Mannie Lionni, a Burlington architect who's been outspoken about the plant's future, described the strategy differently: "I think it's blackmail," he said. But the sense of urgency the threat of demolition creates — even if it rankles some — could be useful in drumming up support for the proposal. This calculation also factored into Weinberger's decision. "I think it's going to help the proposal get built," he said, by making clear to potential donors, investors and other supporters that this may be their last chance to remold the plant or see it razed. On December 2, Cooke, Crockenberg and Tipper visited the Moran Plant with Tom Carr, who managed the plant back when it was still spewing coal smoke. The interior of the brick-and-steel building is graffiti-covered and cavernous, and exposed, fire-escape-style staircases zigzag to vertiginous heights. The plant's most striking feature, which would stay intact under the current plan, is a row of "bunkers" — gigantic inverted pyramids that used to funnel coal from one floor to another. Viewers can stare down into their steel bellies from a catwalk suspended high above the plant's main floor. Carr, now an octogenarian, said he'd hate to see the building torn down. Asked during a later interview what he thought of the plan, he responded, "I wish them luck." Was he skeptical? "Moderately." But, Carr added, "Hope springs eternal. Their proposal seems to have the best chance of success of any that I've heard so far." Carr's business was coal, not real estate development. But he does have one piece of advice for the New Moran crew regarding their rooftop café. "They might have to put an elevator in. A lot of older people are going to find it difficult to climb all the way up there." Tearing down an old power plant isn't cheap. 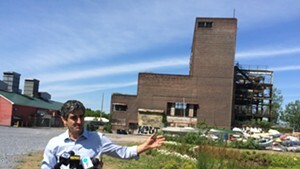 The most recent estimate to raze the seven-story Moran Plant set the price somewhere between $2 and $3 million, according to Burlington Mayor Miro Weinberger. And that was five years ago. In urging voters to make $6 million in tax-increment financing dollars available for the ambitious "New Moran" plan to remake the long-idle generating station, Weinberger has also made a provision for a dramatic Plan B: Draw from the same pot of money earmarked for the plant's resurrection to knock it down instead. He says "blight removal" is a justifiable use of TIF dollars, which are normally used to promote economic development and create public infrastructure. Not everyone supports the mayor's either/or approach. Louis Mannie Lionni, a Burlington architect who's been an outspoken champion of the plant, said he's "strongly opposed to any proposal that even suggests demolition," and there's nothing wrong with letting the superannuated plant remain in a state of disrepair. "It's very difficult for people to accept an empty building, but the fact is it's an honorable building, and I think it's entitled to sit there in a dignified way." Weinberger points out that tearing down the building wouldn't prevent future developments on the site. It would, however, make them harder. That's because an array of new environmental regulations has been added since the Moran Plant stopped burning coal in 1986. Any new structure would likely have fewer stories and be located farther from the water, among other things. And of course it would still have to adhere to the Public Trust Doctrine, a legal principle stipulating that certain resources be reserved for public purposes. Weinberger emphasizes that his preference is to keep the building intact; "I want this to work. I have always been someone who saw a value in the building, in the soaring spaces, the views, its relationship to the lake." The Weinberger administration wants to use a tool known as tax-increment financing, aka TIF, to cover $6.3 million in infrastructure improvements related to the "New Moran" project. Ballot item No. 2 on Town Meeting Day asks Burlington voters to allow the city to borrow that sum, along with an additional $3.3 million for other waterfront initiatives. The total $9.6 million TIF package would have no impact on current city taxpayers; the debt is to be paid by tax revenues generated over the next 20 years as a result of the TIF investment in public infrastructure. And those TIF funds are "conceptually anticipated to leverage" about $33 million in spending on waterfront projects by sources other than the city, according to a campaign pamphlet distributed by proponents of a "yes" vote on ballot item No. 2. Mayor Miro Weinberger is also pledging that the $6.3 million New Moran portion of the TIF bond will not be spent unless the project's private developers meet a series of benchmarks during the next two years. The TIF authorization ballot item on March 4 stipulates that if New Moran does not go forward, a portion of the funding will be used to demolish the defunct power plant. 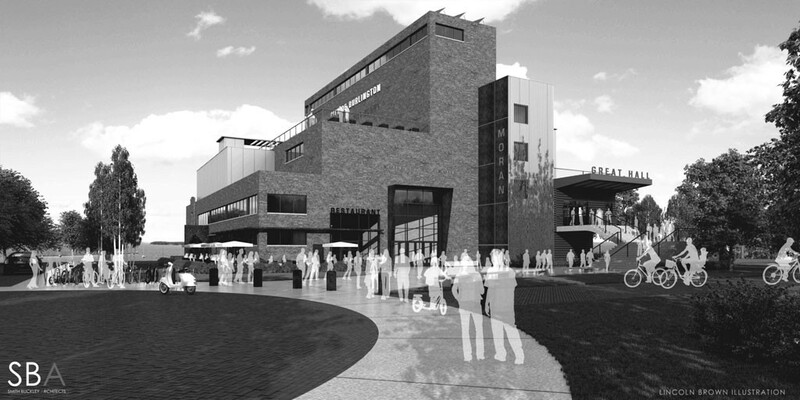 The mayor is seeking to persuade skeptical voters to support a potential public investment in the Moran plant by pointing to "beloved elements of today's waterfront" that the $9.3 million TIF package would also fund. The campaign piece paid for by a Weinberger-backed political action committee cites proposed spending on enhancements of the Community Sailing Center, the ECHO Lake Aquarium and Science Center, and Waterfront Park.